Sevendials is doing what it does well. Local and organic produce where possible and herbs picked from their own terrace garden. With seven years under its belt, this is a very successful restaurant in Brighton. In the summer they open the terrace and when the sun shines it is packed with people enjoying long, lazy lunches. After several failed attempts to get a table, I had been looking forward to eating here for ages. In 2008 they opened a bistro in the Kemptown quarter, Sam's of Brighton which has been tipped in the Harden’s UK Restaurant Guide 2010 as Best up-and-coming UK Restaurant (runner up). I've eaten here very well so had high expectations of Sevendials. Positioned just a few minutes up the hill from Brighton train station at a just-close-your-eyes-and-go-for-it roundabout called Seven Dials, hence the name, most visitors to Brighton heading straight to the centre may miss it which would be a shame. 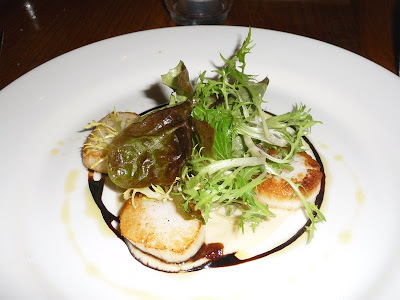 With my bouche suitably amused with a teeny celeriac soup with truffle oil, I started with some seared South Coast Scallops, Cauliflower Purée, aged Balsamic and Parmesan Crisp £7.50. I loved the textures of this dish the most. The scallops were beautifully soft and the mellow sweetness of the purée and tang of the balsamic were perfectly pleasant with them but not a dish I will be rushing back for. The Parmesan crisp was missing, more on that later. Mr GF won the starters round with his choice of Pressed Chicken and Pork Terrine, Chutney and Toast. This was seriously chunky, meaty and perfectly seasoned. The spiced chutney was particularly excellent. 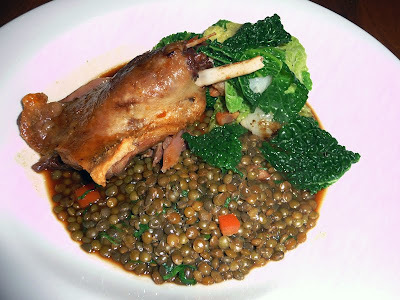 For mains I chose the Confit Duck Leg, Braised Puy Lentils, Savoy Cabbage and Pancetta £14.00. I was a bit let down with the presentation of this dish after eating a much prettier version at The Chequers recently and I think the quality of the duck wasn't as good either. It was tasty although intensely salty (and I like my salt). As this was a much smaller leg, you didn't get those gorgeous, succulent pockets of meat as you would on a larger bird. The lentils and cabbage went quite well although I didn't "get" the silver skin onions in the cabbage. On the other side of the table was a very sophisticated looking plate of Rump of Sussex Lamb, Fondant Potato, French Beans, Roasted Shallots with a Red Wine Sauce, £15.00. This was a better dish overall, the meat cooked perfectly and sauce divine. 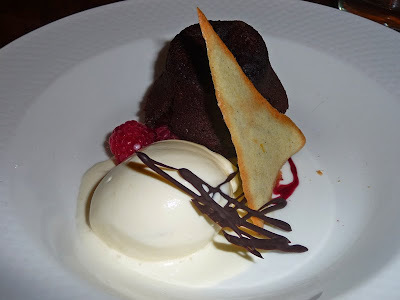 For desserts I ordered a Hot Chocolate Fondant with Mint Choc Ice Cream £6.00. This didn't come with the mint ice cream and frankly it pisses me off when you order something and it doesn't arrive as described. It wouldn't be a problem if it was simply explained upon ordering that it was unavailable or whatever. Despite this, I think the vanilla ice cream was a better choice and it was a really nice pud with a dreamy, gooey centre. 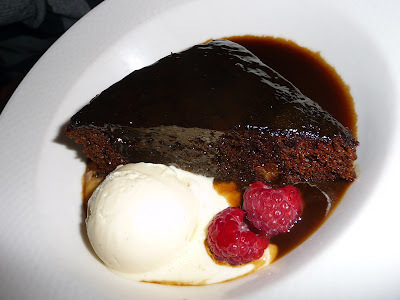 King of the stodge, Mr GF went straight for the Sticky Toffee Pudding, Vanilla Ice Cream and Toffee Sauce £5.50. Typically a sickly pudding, this one was sweet but you got through to the end of it with a smile on you face. Delicious. Service was swift, efficient and friendly. Despite a couple of gripes, I would recommend the Sevendials restaurant. It is one of the better restaurants in town but it isn't one that I would be gagging to go back to soon. There are a few others I would consider to be better food and value wise but I'll be confident in saying that you will not get a dreadful meal here, it just lacked that extra ingredient that makes a restaurant really special. Most people will leave happy as food is safe, solid and sound but unsurprising. Out of the two, their sister restaurant Sam's of Brighton defiantly had the edge if I were to compare, but the more central location of Sevendials may be more convenient for people.